Long sandy beach, warm air and water, strong wind and kiteboarding season from June til January. What else could you wish for? Welcome to Cumbuco! A super long sandy beach, warm air and water temperatures, strong constant southeast winds and a kiteboarding season that lasts from June until January. What else could you folks possibly wish for? 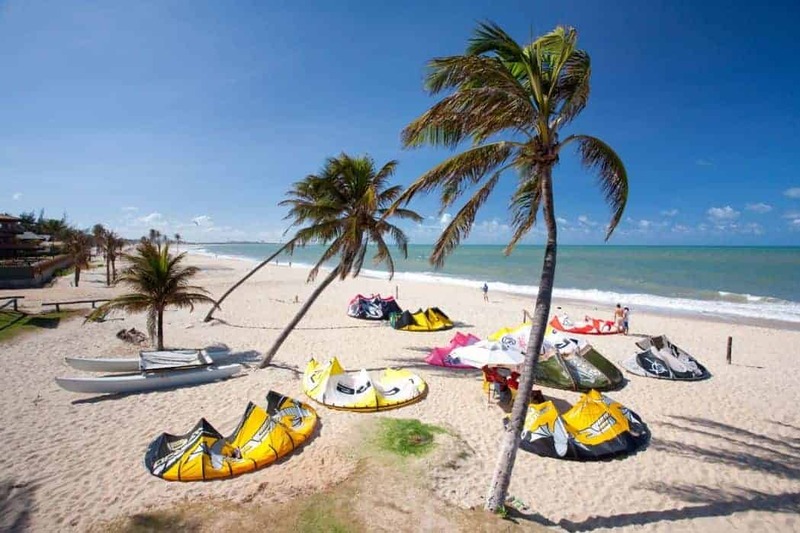 Meet Cumbuco, one of the most popular and recommended kiteboarding spots in whole of Brazil! In essence, we are talking about a fishing village about an hour drive north of the Fortaleza airport. Cumbuco's location and the direction of the wind just makes it to die for kiteboarding destination either for beginners or even for seasoned kiters. The spectacular stretch of sandy beach is more than six kilometres long, so there is plenty of room for everyone to experiment and have fun. And the local hotspot, the famous Cauipe Lagoon, not far away from the Cumbuco centre, with its shallow, flat water and no rocks whatsoever. That just makes the icing on the kite cake. Cauipe is a flat lagoon, 7 kilometres downwind from the centre of the village. Beginners usually go towards its south part. You can find more action at the area to the north. The water can be very shallow or deep depending on the spot. Cauipe is crowded during all seasons. It's usually best to kite early in the morning, or in the afternoon. Being windy for most of the time from June to January, Cumbuco is just beyond imagination. The average speed of the wind is at about 20 knots, cross to cross-onshore from the right. As you head north, it gets even windier. The sun shines almost all year round with average temperatures at about 29°C during the day, falling to 23°C at night. In Cumbuco, you can kite up and down along the entire length of the beach. The spot just near the village’s centre may be packed with swimmers and fishermen, especially on the weekends. Just keep in mind your kiting etiquette here. Respect the locals and give them space. This is their turf! Don't ride up too close to their boats and just don't be an a**, you know what I'm talking about. Watch out for the tides. The beach is much bigger at low tides, but it gets substantially smaller as the sea approaches the coconut trees along the shore. The busiest time in Cumbuco is probably November and December due to the Christmas and New Year holidays. It is best to visit in September, first two weeks of December and the end of January. It is usually much less crowded, but windy enough to keep you busy. No wind? Go Jangada sailing. Not exactly a "no wind" activity, but save it for the days when you just want to step off the board and take a break from kiteboarding. Everyday the local fishermen take people out for the sailing ride on their Jangada's. Even though Jangada sounds a bit like an angry speedboat, it's actually a small fishing boat, so don't expect anything crazy. It's quite a peaceful experience. Book a buggy tour and check out the awesome sand dunes. Out of many different coastal routes on offer, these guys can also take you out to Lagoa de Parnamirim, the lagoon that is located in Tabuba beach and surrounded by the sand dunes. Get a taste of sand boarding here, great fun! Other than that, Cumbuco is ideal for people who want to relax and so there are numerous chilled alternatives from mountains tours to yoga, horse riding or even golf. Small but comfortable guesthouses, known by their local name, “pousadas”, are available in the area. Apartments and houses are a better choice for a longer stay. There are other hotel options near the village centre or a little further away. Where to next? If you're a wave lover, checkout kitesurfing in Punta San Carlos in Mexico. Central America's best. Or the Caribbean? Here is a guide on kitesurfing in Cayman Islands.